Humanscale Element 790 task light is Humanscale’s response to the need for intelligent workspace lighting. 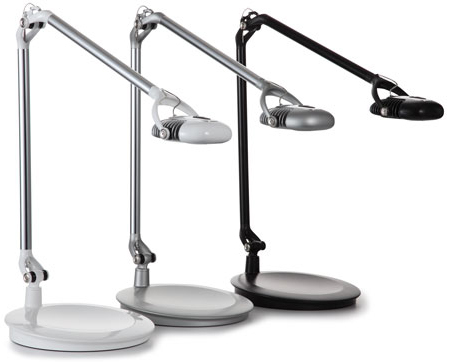 Intuitive and flexible, the Element 790 combines high performance ergonomic design with 360 degrees of adjustability and unprecedented functionality in LED task lamps. A revolutionary task light, the Element 790 delivers the equivalent of light from a 90W incandescent using less than 7W of power. Featuring advanced MCX LED Technology, the Element 790 light provides exceptional performance in a classic, award winning design. The Element 790's innovative ergonomic design and high-performance illumination with a seven-level dimmer for enhanced user control and energy savings. Design Story - The Humanscale Design Studio developed the Element 790 as a revolutionary task light for the modern work environment. The first task light series to employ groundbreaking MCX LED Technology, the team sought to build advanced lighting solutions with beautiful, heat-dispersing designs for a unique, modern aesthetic. Focused Illumination - Providing high performance in an adjustable LED task light, the Element 790 uses a single light source that casts just one shadow. Through the use of MCX LED Technology, the the light produces a large footprint of neutral light (3500K) and superb color quality (CRI 85). Innovative Efficiency - Element 790 feature a unique, heat sink design to maximize light output and increase the light’s usable life. 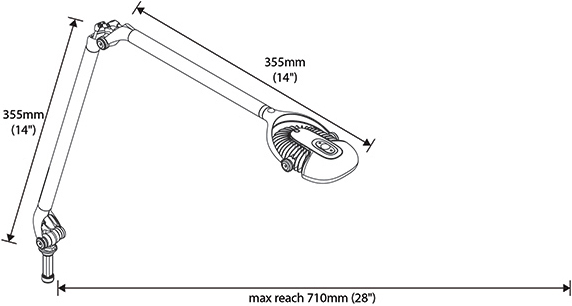 An internal counterbalance provides effortless, one-touch positioning for comfort and complete ease of use. Endless Adjustability - Element 790 comes in a variety of finishes, with 20 mounting options available to tailor it to any work environment. Element 790 is also dimmable to allow for optimal light settings. A universal power supply and interchangeable plug options accommodate global power outlets. Element 790 is available in Arctic White (high-gloss), Silver (semi-matte) and Jet Black (semi-matte).